The OEKO-TEX® Standard 100 is a control system and independent certification for all textile raw materials, intermediate and end products at all stages of processing. Examples of certified products: raw and dyed yarns / melamine, fabrics and raw fabrics and dyed knitted / melamine, packaged items (clothing of all types, fabrics for domestic use, bed linen, terry toweling articles, textile toys, etc. In general, the requirements go far beyond existing national laws. The OEKO-TEX® tests for harmful substances are increasingly turning to the effective use of the textile product destination. More a product remains in contact with the skin, more restrictive are the ecological requirements which it must satisfy. 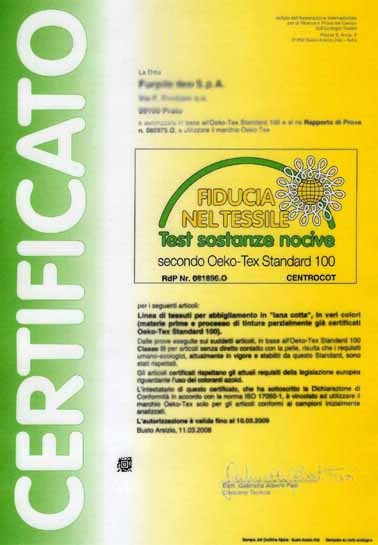 The prerequisite for the certification of textile products according to OEKO-TEX® Standard 100 is that all components of a product satisfying, without exception, the requirements, so the sewing threads, collar stays, prints in addition to the outer fabric also, for example, etc. . as well as non-textile accessories such as buttons, zippers, rivets, etc. Research and development, production and sale of flexible polyurethane foams. 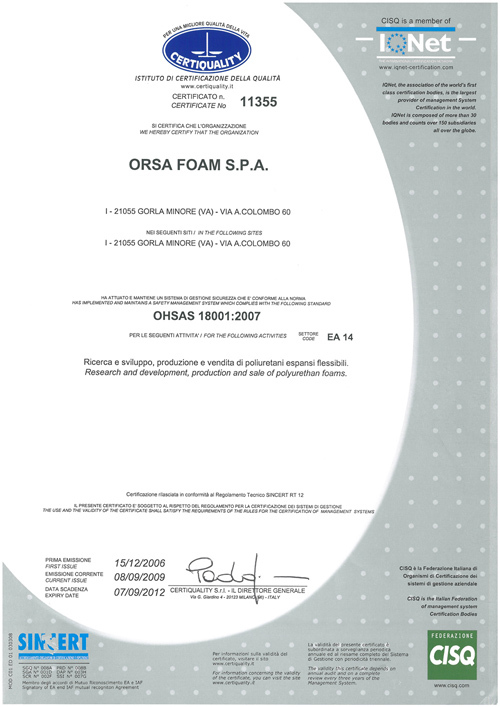 Certificate issued to Orsa Foam Spa that produces polyurethane components (So Memory, Memory Waterlily etc) which are manufactured products Brand Gabrielli among others. 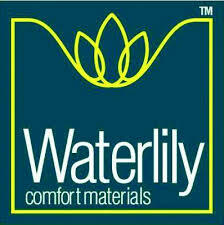 You will find this label on many items Gabrielli, the name of the mattress, topper, cushion made with these foams and memory will always bring the words "Waterlily"
compliance with the requirements of Oeko Tex Standard 100, Class IV (n RdP. 030992.O). characteristics of fire behavior according to some of the most important regulations in the field (remember that the user must check the suitability of the material as a function of the particular use to which it must do). 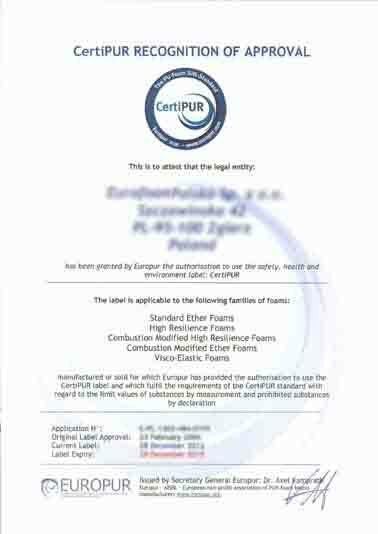 CertiPUR is a voluntary program verification, testing and certification relating to environmental sustainability, safety and health of the polyurethane foam used in the production of mattresses and elements of upholstered furniture. CertiPUR specify the substances which may not be used in the production of polyurethane foams and sets strict maximum levels for some components. CertiPUR is a registered trademark of Europur. Only producers of certified foams and comply with CertiPUR standards are allowed to use the CertiPUR logo. You can transfer this right to the customers that produce pillows and mattresses and they buy certified foam, provided that the logo appears only on products made exclusively with this foam. That's why you can find the CertiPUR logo on components of furniture and mattresses that are not necessarily sold by the brand of a direct label holder. The system ensures full transparency. It is based on clear criteria that require companies to comply with the parameters related to substances contained in foams, which could be harmful to health or the environment. The foams produced by the label holders are verified annually by independent laboratories to ensure that they continue to conform to the CertiPUR specifications. If a company does not exceed the controls, it is required to fix it immediately. In the case of a second failure, the company is excluded from the CertiPUR system and loses the right to use its label. Purchase a mattress or a piece of furniture bearing the CertiPUR logo ensures that the foam contained complies with the strict specifications of CertiPUR. However, it may happen that on mattresses or furniture elements are present other certificates, as some systems analyze all components within a product (textiles, etc..). Two systems with similar quality requirements for polyurethane foams are particularly Oeko Tex 100 and the EU Ecolabel. NB: Best Mattress Srl (hereinafter the company) is concerned to ensure that the companies present on the site achieve its articles to protect the environment, workers and not the least of its customers. The raw materials used by the companies covered in the site are of Italian origin, except for some high-quality raw materials and noble of higher quality fibers if from abroad (eg the Polish goose down for the construction of quilts with greater cuin report, weight / heat). The certificates and the related certificates published were not released to the company but to manufacturers that the company will appeal and, in some cases, the images are purely illustrative and do not correspond to a certificate issued to one of them.